A quick one this, just to acknowledge another good beer coming out of the Brew Wharf under resident brewers Saints and Sinners. Following Hoptimum, Goldfish Bowl and Field of Dreams is Tasty. 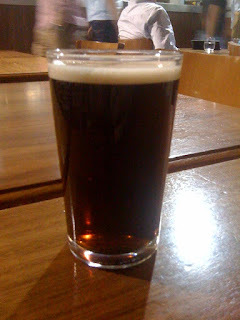 A tribute to a tribute beer; based loosely on Mike "Tasty" McDole's Janet's Brown Ale. 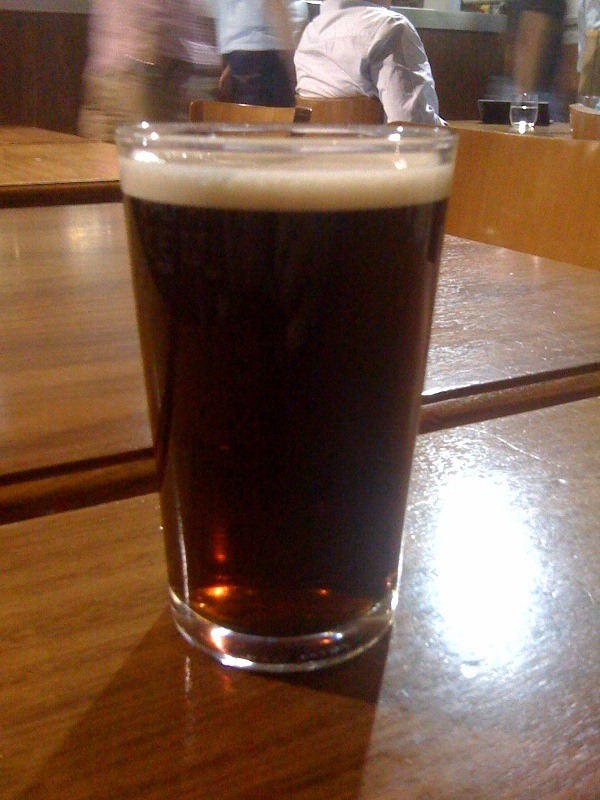 Tasty - the beer not the person - is a heavily hopped US style Brown ale. It pours a deep chestnut with a dense creamy head on top. This beer is the Harvey Dent of the beverage world. The nose is dominated by a mass of citrusy US hops, your eyes tell you to expect roasted aroma, but you get orangey chinook leaping from the glass instead. Then it flips over on you and the taste is just choc-full of, well ... chocolate! The hops are there, some roastiness too, but it's all about the deep, rich, velvety chocolate. It's exceptionally smooth and full in the mouth and then finishes with a real biting bitterness. Fantastically drinkable and refreshingly different. Part of me wants the next release to be a bad beer ... it must be getting boring me banging on about how great these beers have been! It might be a fluke, but I'm convinced this beer was served warmer than the last one I had at Brew Wharf. The main criticism I've made of Brew Wharf beers is that they're served a bit too cold. Hopefully it wasn't a fluke! That's your main criticism? Are prices a bit more normal these days? Nut, £3.90 a pint. They could do with shaving 50p off the price IMO to take the sting out. I really enjoyed Tasty and could happily have had several more (if it wasn't so far from pay day!) Dangerously drinkable and I found neither Tasty nor Field of Dreams to be too cold. A very welcome addition to the Borough Market beer scene and infinitely better than what was coming out of Brew Wharf previously. Yep, main criticism. Can only agree with what Dubbel says. If you're eating or drinking around London Bridge then you can expect to pay a premium for everything. Brew Wharf is over price but at least your paying £4 for good beer brewed with passion on premesis. Go round the corner and you can pay the same price for a pint of London Pride. I know which I prefer! Here now and the Tasty is even better than it was on Friday! Gotta say I'm a fan. They're fitting a 'smokers roof' over the tables out the front too. The beer looks and sounds delicious. I'd be sad that I can't have a pint (at any price) except that Phil Lowry will be here in California, if the volcano god is willing, and he has said he's bringing some Tasty with him. Dubbel: Must've just missed you last night. Noticed the "smokers roof" ... seems like an odd time of year to be putting one in. Tasty: Fingers crossed for the volcano God(s?). I hope it doesn't suffer too much from the travelling.